Data is your friend. It helps us make better decisions and helps to clear up biases. 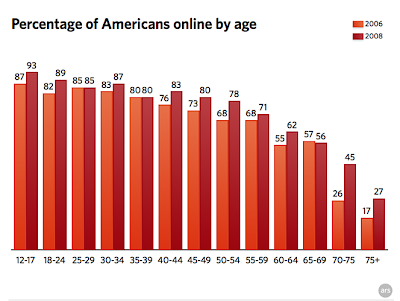 In fact, "older" folks (those over age 32) do a lot of things online more than the young 'uns do. Older users in general don't use the Internet as an entertainment source to the same extent that younger netizens do, instead using it primarily for communication, research, and online shopping. Older users tend to use the Internet more to look up health information, for example, as well as religious information and governmental research. Generation Xers (those between 33 and 44) lead the pack in online shopping as well, with 80 percent using the Internet to buy products, compared with 71 percent of Internet users between 18 and 32. Gen Xers also lead when it comes to online banking, though Pew notes that, as Gen Y users grow older and, you know, get jobs, they will be just as likely to bank online. --Read more at ARS Technica. A few other quick things. Government sites: 59% of all Internet users visit government sites. Two-thirds of Gen X (33-44) visit government sites (the biggest group), teens, pretty much not at all. Email: One-quarter of teens do not use email. Over 90% of people 18-72 use email. Broadband: Older people are less likely to have broadband. Less than 1/2 of the people older than 60 have broadband at home compared with over 2/3rds of the users younger than 50. There's a great chart with data on how different age cohorts use the Internet at Pew Internet & American Life Project, you can read it here.